1) I am looking for an app that tracks sleep automatically. I know that @blaine07 recommended Sleep++, however you actually have to tell it when you're going to sleep. 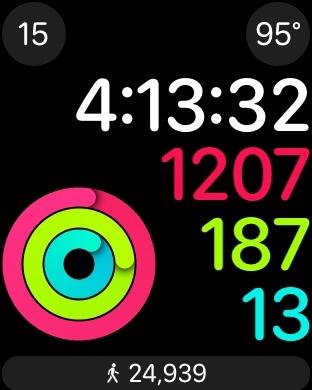 2) I am looking for an app that will allow me to show my steps on the watch face. Coming back to an AW from my Fitbit and Garmin I liked that I didn't have to drill down to see my steps. 3) This is a long shot, but is it possible to use the AW as a remote for Apple TV? 4) I know there is a way to sync my data from Apple Health to the Fitbit app, but is there a way to sync the data from Apple Health to Garmin Connect? That is all for now, but if I think of anymore I will post them here. Thanks in advance! 1) I am looking for an app that tracks sleep automatically. I know that recommended Sleep++, however you actually have to tell it when you're going to sleep. I use the app "HeartWatch" and its companion app "AutoSleep" to track sleep. It works great for me. There are times when it misses when I wake up to go to the bathroom, or wake up for a few minutes, but it's generally spot-on. Thanks, I'll check those apps out! AutoSleep had better ratings than the other apps I looked out. The way I read it is that it's automatic, like the Fitbit and Garmin, and I don't have to turn it on before I go to sleep like Sleep++. Is this correct? Also how's HeartWatch work with AutoSleep to track sleep? Correct, it is automatic. You can force press the icon to say that you are going to sleep (or waking up). I never do so; it always tracks sleep and wake times properly for me. I'm not sure how. A combination of accelerometer and heart rate? Here is Autosleep's tips from the app. Thanks! I'm almost certain I'm going to buy AutoSleep. Is HeartWatch required as well or not? I have both, but, from what I can tell from the App Store description, AutoSleep should be standalone. I'd buy just that if you don't need HeartWatch. Thanks, I'll for sure pick up AutoSleep and give HeartWatch another glance. Thanks, I never even noticed that app! It works great so far and my only complaint is I can't adjust the volume. I use the app "HeartWatch" and its companion app "AutoSleep" to track sleep. So I bought AutoSleep and I used it the last couple of nights, and it works great. Thanks for the recommendation! I might buy HeartWatch in the next few days as it says in AutoSleep to "Get HeartWatch app to analyze your sleep, heart rate and activity in much more detail." In another thread @tcuprof mentioned HealthFace that will show the steps as a complication on the watch face. I’m still gathering information on the app from them so I haven’t purchased it yet.